The molecular formula is C18H19N3O∙HCl∙2H2O, representing a molecular weight of 365.9. Ondansetron HCl dihydrate is a white to off-white powder that is soluble in water and normal saline. 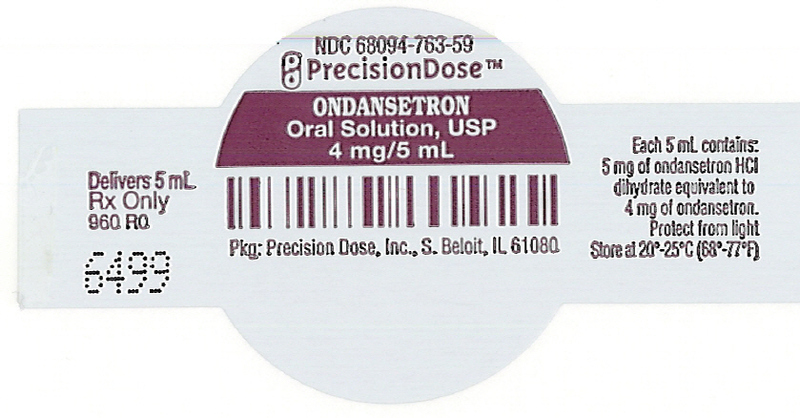 Each 5 mL of Ondansetron Oral Solution, USP contains 5 mg of ondansetron HCl dihydrate equivalent to 4 mg of ondansetron. Ondansetron Oral Solution, USP contains the inactive ingredients citric acid anhydrous, glycerin, saccharin sodium, sodium benzoate, sodium citrate, and strawberry flavor. Ondansetron is well absorbed from the gastrointestinal tract and undergoes some first-pass metabolism. Mean bioavailability in healthy subjects, following administration of a single 8 mg tablet, is approximately 56%. Ondansetron systemic exposure does not increase proportionately to dose. AUC from a 16 mg tablet was 24% greater than predicted from an 8 mg tablet dose. This may reflect some reduction of first-pass metabolism at higher oral doses. Bioavailability is also slightly enhanced by the presence of food but unaffected by antacids. In vitro metabolism studies have shown that ondansetron is a substrate for human hepatic cytochrome P-450 enzymes, including CYP1A2, CYP2D6, and CYP3A4. In terms of overall ondansetron turnover, CYP3A4 played the predominant role. Because of the multiplicity of metabolic enzymes capable of metabolizing ondansetron, it is likely that inhibition or loss of one enzyme (e.g., CYP2D6 genetic deficiency) will be compensated by others and may result in little change in overall rates of ondansetron elimination. Ondansetron elimination may be affected by cytochrome P-450 inducers. In a pharmacokinetic study of 16 epileptic patients maintained chronically on CYP3A4 inducers, carbamazepine, or phenytoin, reduction in AUC, Cmax, and t1/2 of ondansetron was observed.1 This resulted in a significant increase in clearance. However, on the basis of available data, no dosage adjustment for ondansetron is recommended (see PRECAUTIONS: Drug Interactions). Due to the very small contribution (5%) of renal clearance to the overall clearance, renal impairment was not expected to significantly influence the total clearance of ondansetron. However, ondansetron oral mean plasma clearance was reduced by about 50% in patients with severe renal impairment (creatinine clearance < 30 mL/min). This reduction in clearance is variable and was not consistent with an increase in half-life. No reduction in dose or dosing frequency in these patients is warranted. Four and 8 mg doses of ondansetron oral solution are bioequivalent to corresponding doses of ondansetron tablets and may be used interchangeably. One 24 mg ondansetron tablet is bioequivalent to and interchangeable with three 8 mg ondansetron tablets. In 2 randomized, double-blind, monotherapy trials, a single 24 mg ondansetron tablet was superior to a relevant historical placebo control in the prevention of nausea and vomiting associated with highly emetogenic cancer chemotherapy, including cisplatin ≥ 50 mg/m2. Steroid administration was excluded from these clinical trials. More than 90% of patients receiving a cisplatin dose ≥ 50 mg/m2 in the historical placebo comparator experienced vomiting in the absence of antiemetic therapy. The first trial compared oral doses of ondansetron 24 mg once a day, 8 mg twice a day, and 32 mg once a day in 357 adult cancer patients receiving chemotherapy regimens containing cisplatin ≥ 50 mg/m2. A total of 66% of patients in the ondansetron 24 mg once-a-day group, 55% in the ondansetron 8 mg twice-a-day group, and 55% in the ondansetron 32 mg once-a-day group completed the 24-hour study period with 0 emetic episodes and no rescue antiemetic medications, the primary endpoint of efficacy. Each of the 3 treatment groups was shown to be statistically significantly superior to a historical placebo control. In the same trial, 56% of patients receiving oral ondansetron 24 mg once a day experienced no nausea during the 24-hour study period, compared with 36% of patients in the oral ondansetron 8 mg twice-a-day group (p = 0.001) and 50% in the oral ondansetron 32 mg once-a-day group. In a second trial, efficacy of the oral ondansetron 24 mg once-a-day regimen in the prevention of nausea and vomiting associated with highly emetogenic cancer chemotherapy, including cisplatin ≥50 mg/m2, was confirmed. The first dose was administered 30 minutes before the start of emetogenic chemotherapy, with a subsequent dose 8 hours after the first dose. An 8 mg ondansetron tablet was administered twice a day for 2 days after completion of chemotherapy. Median undefined since at least 50% of the patients were withdrawn or had more than 2 emetic episodes. Median undefined since at least 50% of patients did not have any emetic episodes. The first dose was administered 30 minutes before the start of emetogenic chemotherapy, with subsequent doses 4 and 8 hours after the first dose. An 8 mg ondansetron tablet was administered 3 times a day for 2 days after completion of chemotherapy. Visual analog scale assessment: 0 = no nausea, 100 = nausea as bad as it can be. In uncontrolled trials, 148 patients receiving cyclophosphamide-based chemotherapy were re-treated with ondansetron tablets 8 mg 3 times daily during subsequent chemotherapy for a total of 396 re-treatment courses. No emetic episodes occurred in 314 (79%) of the re-treatment courses, and only 1 to 2 emetic episodes occurred in 43 (11%) of the re-treatment courses. Three open-label, uncontrolled, foreign trials have been performed with 182 pediatric patients 4 to 18 years old with cancer who were given a variety of cisplatin or noncisplatin regimens. In these foreign trials, the initial dose of ondansetron HCl injection ranged from 0.04 to 0.87 mg/kg for a total dose of 2.16 to 12 mg. This was followed by the administration of ondansetron tablets ranging from 4 to 24 mg daily for 3 days. In these studies, 58% of the 170 evaluable patients had a complete response (no emetic episodes) on day 1. Two studies showed the response rates for patients less than 12 years of age who received ondansetron tablets 4 mg 3 times a day to be similar to those in patients 12 to 18 years of age who received ondansetron tablets 8 mg 3 times daily. Thus, prevention of emesis in these pediatric patients was essentially the same as for patients older than 18 years of age. Overall, ondansetron tablets were well tolerated in these pediatric patients. In a randomized, double-blind study in 20 patients, ondansetron tablets (8 mg given 1.5 hours before each fraction of radiotherapy for 4 days) were significantly more effective than placebo in preventing vomiting induced by total body irradiation. Total body irradiation consisted of 11 fractions (120 cGy per fraction) over 4 days for a total of 1,320 cGy. Patients received 3 fractions for 3 days, then 2 fractions on day 4. Ondansetron was significantly more effective than metoclopramide with respect to complete control of emesis (0 emetic episodes) in a double-blind trial in 105 patients receiving single high-dose radiotherapy (800 to 1,000 cGy) over an anterior or posterior field size of ≥80 cm2 to the abdomen. Patients received the first dose of ondansetron tablets (8 mg) or metoclopramide (10 mg) 1 to 2 hours before radiotherapy. If radiotherapy was given in the morning, 2 additional doses of study treatment were given (1 tablet late afternoon and 1 tablet before bedtime). If radiotherapy was given in the afternoon, patients took only 1 further tablet that day before bedtime. Patients continued the oral medication on a 3 times a day basis for 3 days. Ondansetron was significantly more effective than prochlorperazine with respect to complete control of emesis (0 emetic episodes) in a double-blind trial in 135 patients receiving a 1- to 4-week course of fractionated radiotherapy (180 cGy doses) over a field size of ≥100 cm2 to the abdomen. Patients received the first dose of ondansetron tablets (8 mg) or prochlorperazine (10 mg) 1 to 2 hours before the patient received the first daily radiotherapy fraction, with 2 subsequent doses on a 3 times a day basis. Patients continued the oral medication on a 3 times a day basis on each day of radiotherapy. Surgical patients who received ondansetron 1 hour before the induction of general balanced anesthesia (barbiturate: thiopental, methohexital, or thiamylal; opioid: alfentanil, sufentanil, morphine, or fentanyl; nitrous oxide; neuromuscular blockade: succinylcholine/curare or gallamine and/or vecuronium, pancuronium, or atracurium; and supplemental isoflurane or enflurane) were evaluated in 2 double-blind studies (1 US study, 1 foreign) involving 865 patients. Ondansetron tablets (16 mg) were significantly more effective than placebo in preventing postoperative nausea and vomiting. The study populations in all trials thus far consisted of women undergoing inpatient surgical procedures. No studies have been performed in males. No controlled clinical study comparing ondansetron tablets to ondansetron injection has been performed. Prevention of nausea and vomiting associated with highly emetogenic cancer chemotherapy, including cisplatin ≥50 mg/m2. Prevention of postoperative nausea and/or vomiting. As with other antiemetics, routine prophylaxis is not recommended for patients in whom there is little expectation that nausea and/or vomiting will occur postoperatively. In patients where nausea and/or vomiting must be avoided postoperatively, Ondansetron Oral Solution, USP is recommended even where the incidence of postoperative nausea and/or vomiting is low. The concomitant use of apomorphine with Ondansetron Oral Solution, USP is contraindicated based on reports of profound hypotension and loss of consciousness when apomorphine was administered with Ondansetron Oral Solution, USP. Ondansetron Oral Solution, USP is contraindicated for patients known to have hypersensitivity to the drug. ECG changes including QT interval prolongation has been seen in patients receiving ondansetron. In addition, post-marketing cases of Torsade de Pointes have been reported in patients using ondansetron. Avoid ondansetron in patients with congenital long QT syndrome. ECG monitoring is recommended in patients with electrolyte abnormalities (e.g., hypokalemia or hypomagnesemia), congestive heart failure, bradyarrhythmias or patients taking other medicinal products that lead to QT prolongation. Ondansetron does not itself appear to induce or inhibit the cytochrome P-450 drug-metabolizing enzyme system of the liver (see CLINICAL PHARMACOLOGY, Pharmacokinetics). Because ondansetron is metabolized by hepatic cytochrome P-450 drug-metabolizing enzymes (CYP3A4, CYP2D6, CYP1A2), inducers or inhibitors of these enzymes may change the clearance and, hence, the half-life of ondansetron. On the basis of available data, no dosage adjustment is recommended for patients on these drugs. Based on reports of profound hypotension and loss of consciousness when apomorphine was administered with ondansetron, concomitant use of apomorphine with ondansetron is contraindicated (see CONTRAINDICATIONS). Tumor response to chemotherapy in the P-388 mouse leukemia model is not affected by ondansetron. In humans, carmustine, etoposide, and cisplatin do not affect the pharmacokinetics of ondansetron. The coadministration of ondansetron had no effect on the pharmacokinetics and pharmacodynamics of temazepam. Reproduction studies have been performed in pregnant rats and rabbits at daily oral doses up to 15 and 30 mg/kg/day, respectively, and have revealed no evidence of impaired fertility or harm to the fetus due to ondansetron. There are, however, no adequate and well-controlled studies in pregnant women. Because animal reproduction studies are not always predictive of human response, this drug should be used during pregnancy only if clearly needed. Of the total number of subjects enrolled in cancer chemotherapy-induced and postoperative nausea and vomiting in US- and foreign-controlled clinical trials, for which there were subgroup analyses, 938 were 65 years of age and over. No overall differences in safety or effectiveness were observed between these subjects and younger subjects, and other reported clinical experience has not identified differences in responses between the elderly and younger patients, but greater sensitivity of some older individuals cannot be ruled out. Dosage adjustment is not needed in patients over the age of 65 (see CLINICAL PHARMACOLOGY). The following have been reported as adverse events in clinical trials of patients treated with ondansetron, the active ingredient of Ondansetron Oral Solution, USP. A causal relationship to therapy with ondansetron has been unclear in many cases. The adverse events in Table 5 have been reported in ≥5% of adult patients receiving a single 24 mg ondansetron tablet in 2 trials. These patients were receiving concurrent highly emetogenic cisplatin-based chemotherapy regimens (cisplatin dose ≥50 mg/m2). The adverse events in Table 6 have been reported in ≥5% of adults receiving either 8 mg of ondansetron tablets 2 or 3 times a day for 3 days or placebo in 4 trials. These patients were receiving concurrent moderately emetogenic chemotherapy, primarily cyclophosphamide-based regimens. In 723 patients receiving cyclophosphamide-based chemotherapy in US clinical trials, AST and/or ALT values have been reported to exceed twice the upper limit of normal in approximately 1% to 2% of patients receiving ondansetron tablets. The increases were transient and did not appear to be related to dose or duration of therapy. On repeat exposure, similar transient elevations in transaminase values occurred in some courses, but symptomatic hepatic disease did not occur. The role of cancer chemotherapy in these biochemical changes cannot be clearly determined. Rare cases of anaphylaxis, bronchospasm, tachycardia, angina (chest pain), hypokalemia, electrocardiographic alterations, vascular occlusive events, and grand mal seizures have been reported. Except for bronchospasm and anaphylaxis, the relationship to ondansetron was unclear. The adverse events reported in patients receiving ondansetron tablets and concurrent radiotherapy were similar to those reported in patients receiving ondansetron tablets and concurrent chemotherapy. The most frequently reported adverse events were headache, constipation, and diarrhea. The adverse events in Table 7 have been reported in ≥5% of patients receiving ondansetron tablets at a dosage of 16 mg orally in clinical trials. With the exception of headache, rates of these events were not significantly different in the ondansetron and placebo groups. These patients were receiving multiple concomitant perioperative and postoperative medications. In addition to adverse events reported from clinical trials, the following events have been identified during post-approval use of oral formulations of ondansetron. Because they are reported voluntarily from a population of unknown size, estimates of frequency cannot be made. The events have been chosen for inclusion due to a combination of their seriousness, frequency of reporting, or potential causal connection to ondansetron. Special Senses: Eye Disorders: Cases of transient blindness, predominantly during intravenous administration, have been reported. These cases of transient blindness were reported to resolve within a few minutes up to 48 hours. In addition to the adverse events listed above, the following events have been described in the setting of ondansetron overdose: "Sudden blindness" (amaurosis) of 2 to 3 minutes' duration plus severe constipation occurred in 1 patient that was administered 72 mg of ondansetron intravenously as a single dose. Hypotension (and faintness) occurred in a patient that took 48 mg of ondansetron tablets. Following infusion of 32 mg over only a 4-minute period, a vasovagal episode with transient second-degree heart block was observed. In all instances, the events resolved completely. The recommended adult oral dosage of ondansetron is 24 mg given as three 8 mg tablets administered 30 minutes before the start of single-day highly emetogenic chemotherapy, including cisplatin ≥50 mg/m2 . Multiday, single-dose administration of a 24 mg dosage has not been studied. Pediatric Use: There is no experience with use of a 24 mg dosage in pediatric patients. Geriatric Use: The dosage recommendation is the same as for the general population. The recommended adult oral dosage is 10 mL (2 teaspoonfuls equivalent to 8 mg of ondansetron) of Ondansetron Oral Solution, USP given twice a day. The first dose should be administered 30 minutes before the start of emetogenic chemotherapy, with a subsequent dose 8 hours after the first dose. 10 mL (2 teaspoonfuls equivalent to 8 mg of ondansetron) of Ondansetron Oral Solution, USP should be administered twice a day (every 12 hours) for 1 to 2 days after completion of chemotherapy. Pediatric Use: For pediatric patients 12 years of age and older, the dosage is the same as for adults. For pediatric patients 4 through 11 years of age, the dosage is 5 mL (1 teaspoonful equivalent to 4 mg of ondansetron) of Ondansetron Oral Solution, USP given 3 times a day. The first dose should be administered 30 minutes before the start of emetogenic chemotherapy, with subsequent doses 4 and 8 hours after the first dose. 5 mL (1 teaspoonful equivalent to 4 mg of ondansetron) of Ondansetron Oral Solution, USP should be administered 3 times a day (every 8 hours) for 1 to 2 days after completion of chemotherapy. Geriatric Use: The dosage is the same as for the general population. The recommended oral dosage is 10 mL (2 teaspoonfuls equivalent to 8 mg of ondansetron) of Ondansetron Oral Solution, USP given 3 times a day. For total body irradiation, 10 mL (2 teaspoonfuls equivalent to 8 mg of ondansetron) of Ondansetron Oral Solution, USP should be administered 1 to 2 hours before each fraction of radiotherapy administered each day. For single high-dose fraction radiotherapy to the abdomen, 10 mL (2 teaspoonfuls equivalent to 8 mg of ondansetron) of Ondansetron Oral Solution, USP should be administered 1 to 2 hours before radiotherapy, with subsequent doses every 8 hours after the first dose for 1 to 2 days after completion of radiotherapy. For daily fractionated radiotherapy to the abdomen, 10 mL (2 teaspoonfuls equivalent to 8 mg of ondansetron) of Ondansetron Oral Solution, USP should be administered 1 to 2 hours before radiotherapy, with subsequent doses every 8 hours after the first dose for each day radiotherapy is given. Pediatric Use: There is no experience with the use of Ondansetron Oral Solution, USP in the prevention of radiation-induced nausea and vomiting in pediatric patients. The recommended dosage is 16 mg given as 20 mL (4 teaspoonfuls equivalent to 16 mg of ondansetron) of Ondansetron Oral Solution, USP 1 hour before induction of anesthesia. Pediatric Use: There is no experience with the use of Ondansetron Oral Solution, USP in the prevention of postoperative nausea and vomiting in pediatric patients. Ondansetron Oral Solution, USP, a clear, colorless liquid with a characteristic strawberry odor, contains 5 mg of odansetron HCl dihydrate equivalent to 4 mg of ondansetron per 5 mL. Store at 20° to 25°C (68° to 77°F). [See USP Controlled Room Temperature.] Protect from light.